You work hard to communicate with employees, but despite your best efforts, employees aren’t fully engaged. What can you do differently? Start by leveraging a core strategy from leading consumer-product companies. These marketers spend a great deal of time studying target customers to gain insights about habits, attitudes and preferences. By adopting the same technique, you can gain a deep understanding of employee needs and create meaningful and useful communication. 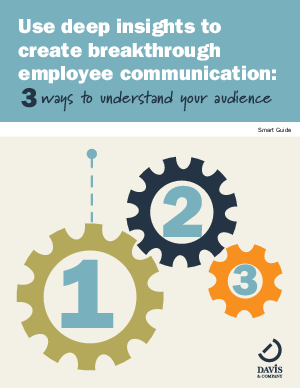 Read this white paper to learn how to create meaningful employee communication by understanding your audience’s needs and preferences.